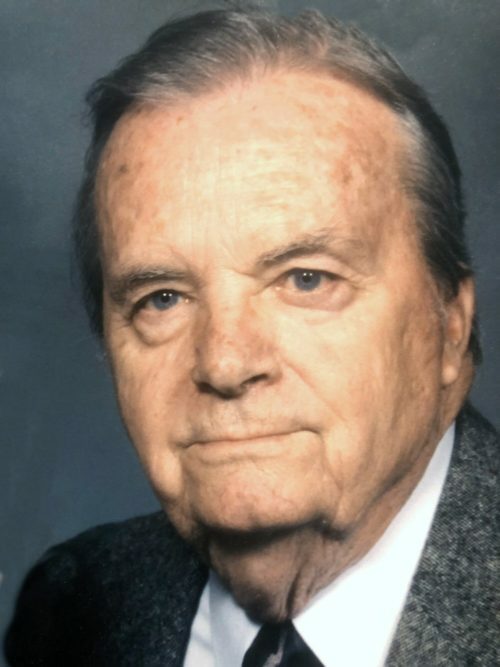 Dean Sheplee Nauman, 99, of Centennial, Colorado, passed away on April 3, 2019 after a long and productive life. Dean was an enthusiastic artist, and completed hundreds of paintings. His subject matter included natural still lifes and landscapes from the mountains and prairies of Colorado and South Dakota to the harbors of New England and the rugged bluffs of the Pacific Ocean; from the streets of Mexico, to the ruins of Europe and Egypt. He worked in a wide variety of mediums and artistic techniques, always pushing the boundaries to create his own unique vision. Many of his paintings are viewable on Facebook. Born September 13, 1919, the middle son of Ralph and Charlotte Nauman on a wheat farm near Gettysburg, South Dakota, Dean developed an early interest in drawing and producing shows for the local neighborhood. He followed his passion, receiving a Bachelor of Fine Arts at Dakota Wesleyan University in Mitchell, South Dakota, also studying one year at the University of Iowa. He began work for a Master of Fine Arts at the Chicago Art Institute. After Graduation he taught art at Wesleyan until he was drafted into the Army during the second world war. He trained as a glider pilot in the Air Corps. He served for four years, which included a tour in India in intelligence. After discharge he returned to South Dakota, working at the Chamber of Commerce in Hot Springs, where he met and married Ida May Pengra. They moved to Rapid City where he focused on graphic art, and joined several advertising agencies. He finally started his own agency, Nauman Advertising, and purchased a printing company, renaming it Nauman Printing. In 1982 he won the Advertising Silver Medal Award from the American Advertising Federation. He was active in the community, mentoring, teaching, working in leadership positions at the library, and fine art center. At age 66 he sold the printing company and he and Ida May moved to Denver Colorado, where he joined his growing family. There he painted, wrote a couple of books and created short videos and documentaries illustrating poetry, his own writing and topics of interest. He volunteered at the Museum of Nature and Science for over a decade, designing and building displays, planetarium shows, visiting shows, and more, along with other civic volunteering. He was dedicated to his family and to his love of color, art history and natural history. He enjoyed traveling and took his family on many adventures across the United States and parts of Europe. He is fondly remembered by his extended family and his many close friends. He is survived by a son John Nauman, Pittsburgh, and a daughter Elizabeth (Tom) Gerhardt, Littleton, four grandchildren: Jess Burlason, Charlotte Briscoe, Stephanie Armstrong, Melanie Gerhardt and seven great grandchildren: Aaryana, Phoenix, Ryker, Avery, Everett, Alister, and Rowan. His wife, Ida May, and his oldest daughter, Deanna had preceded him in death. Also preceding him in death are his brothers Ralph Nauman and Charles Nauman of South Dakota. A short service will be held in June at Fort Logan National Cemetery. Uncle Dean , the last of his generation of the Nauman family, he will be missed. My deepest condolences to the friends and family of Dean. May your treasured memories bring you joy, and may ‘the God of all comfort’ give you strength, along with a measure of peace for your grieving hearts at this most difficult time. Uncle Dean always had a curious mind about everything, he was easy to talk to and very accepting of other people. His artistic talents speak for themselves. We have wonderful memories of the times we had the opportunity to visit and to learn about his many on going projects. He will be greatly missed!! Uncle Dean, like his brothers Ralph and Charles, my dad, was in the first generation of the Sheplee and Nauman families to go to the university. He came off the farm to be a successful businessman in South Dakota’s second largest town, Rapid City, exercising the honorable printing profession, and never letting it stop him from expressing his artistic abilities. He left me three loving cousins and more family of theirs. The most recent time I talked with him, I said I looked forward to celebrating his 100th birthday with him. He made it to 99! And we are blessed with all he has contributed. Rest in peace, Uncle Dean.